But then I logged on to Twitter. In case you don’t remember, here is what happened. Boris Nemstov, who was a major figure in the period immediately following the implosion of the Soviet Union, had been shot to death on the bridge outside the Kremlin walls. 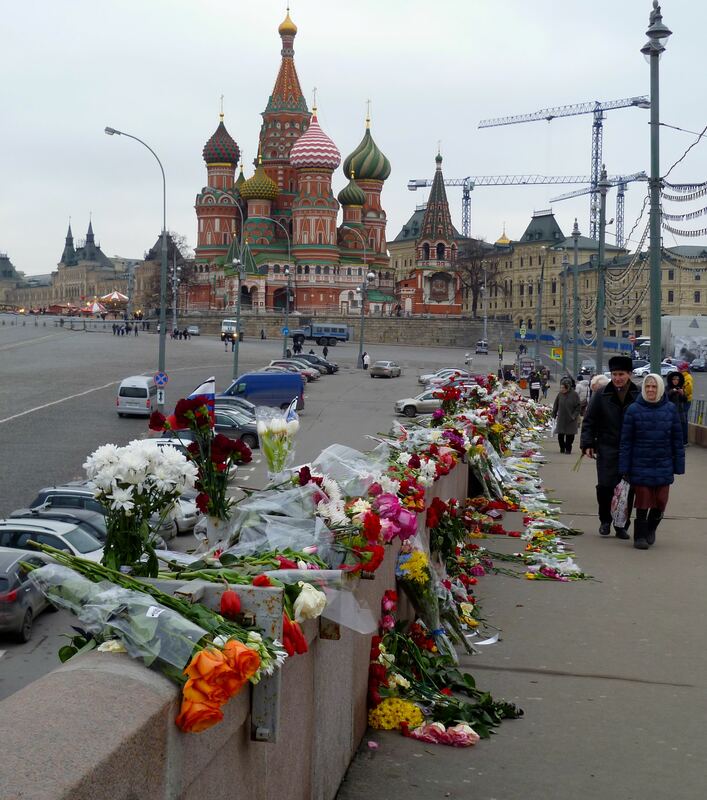 This clearly made it look like a political murder and Moscow hadn’t seen a political murder in a long, long time. We all thought the days of political assassinations were over– a thing of the 90s and the early 2000s. This was 2015. People didn’t get killed now, we thought. Western sources on Twitter insisted that the murder was Kremlin-involved. They pointed out that Nemstov had been involved in the opposition movement, even helping to organize a large anti-Putin march scheduled for the next day. He had become famous for publishing brochures in which he accused Putin of coruption, incompetence, bullheadedness, etc. Furthermore, he was very much against Putin’s position on Ukraine and had spoken out about the annexation of Crimea. To Western eyes, it was an open-and-shut case: Putin had Nemstov killed and had him killed in a very public place as a warning to others: Do Not Cross Me. But the Russian media offered a range of perspectives. I know because I listened to the radio and watching Russian TV all day that Saturday. Ekho Moskvy, a prominent opposition radio station, explored the angle that Putin was involved but also hosted guests that offered other theories: Vesti FM, a fairly mainstream radio station pointed out that Boris Nemstov, in addition to being a politician, was also a businessman. Perhaps this was a settling of accounts, so to speak. Vladimir Zhironovsky, an unhinged racist and bombast respected by no credible journalist, speculated that Nemstov had been killed by a man jealous of his beautiful and young Ukrainian girlfriend. For such a wacko, this was actually a somewhat reasonable theory: Nemstov was famously a womanizer. Some outlets put the blame squarely on the United States, saying that the CIA has killed Nemstov in a bid to weaken Putin. But every broadcast I saw, and every radio program I listened to, offered a range of theories. There was no one consensus about what had happened. 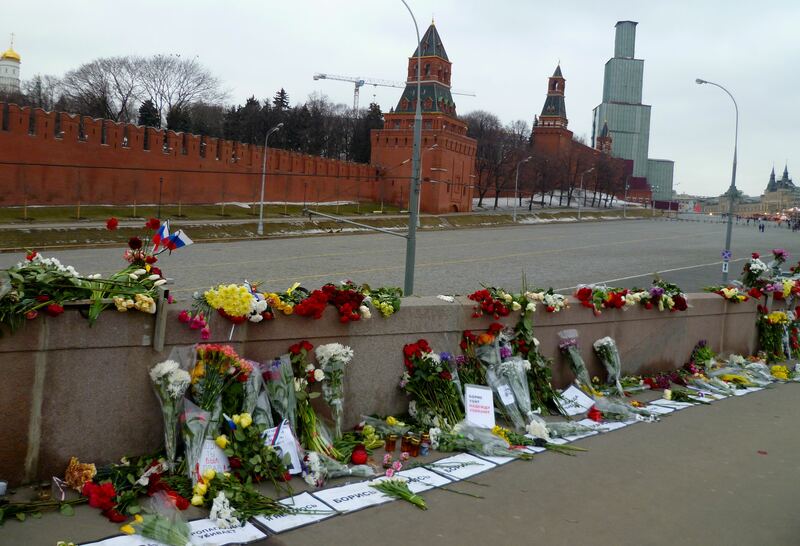 That’s not to say that there wasn’t a feeling common to all Muscovites: there was. That feeling was fear. Fear of a return to the instability of the 90s and early 2000s. Fear of an even more volatile ruble. Fear of increased violence in Eastern Ukraine. Universally, people were shocked and worried. Western sources on Twitter turned their attention to another subject: the Russian media’s coverage of Nemstov’s killing. User after user lambasted the Russian media for its “paranoid fantasies,” its “gullibility,” its “Putin-pandering.” But that’s not what I saw at all. What I saw and heard was a serious discussion of several possible theories, none of which were quickly dismissed out of hand. I cannot say the same for the Western media. In terms of my personal opinion, I just couldn’t see why Putin would have Nemstov killed. The U.S. portrayed Nemstov as a tireless fighter for reform who has led the masses to increasing heights of resistance. That just isn’t true. Nemstov isn’t that. He was a close ally of Boris Yelstin (himself no anti-corruptionist) and then…he just sort of fell out of the national eye. In the past few years Nemstov had focused on local politics of the Yaroslavl region and his own business interests. Yes, he published these brochures, but they weren’t influential. Yes, he helped to organize the next day’s opposition march but he was merely one of many. At a time when Putin’s influence on the world stage is precarious, why would he bother taking out a minor player with no real power? Contrary to many Western views, Putin is no madman and he wouldn’t risk further alienating world powers by taking out a hit on a minor and meaningless political player. He’ll take that sort of risk for Crimea, for Ukraine as a buffer zone between Russia and NATO, but for Nemstov? Nemstov should be so lucky to be thought of as so important. 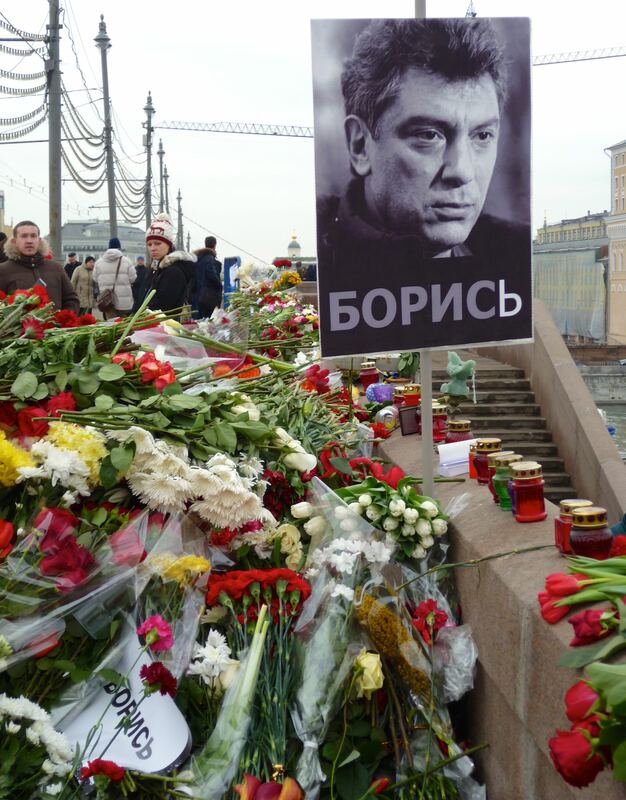 Perhaps even more tellingly, the Russian media fawned over Nemstov after his killing. They called him an honest man (a dubious claim) who cared about his region (Yaroslavl) and helped usher in a new era after the fall of communism. Opinion-makers bent over backwards to praise him. 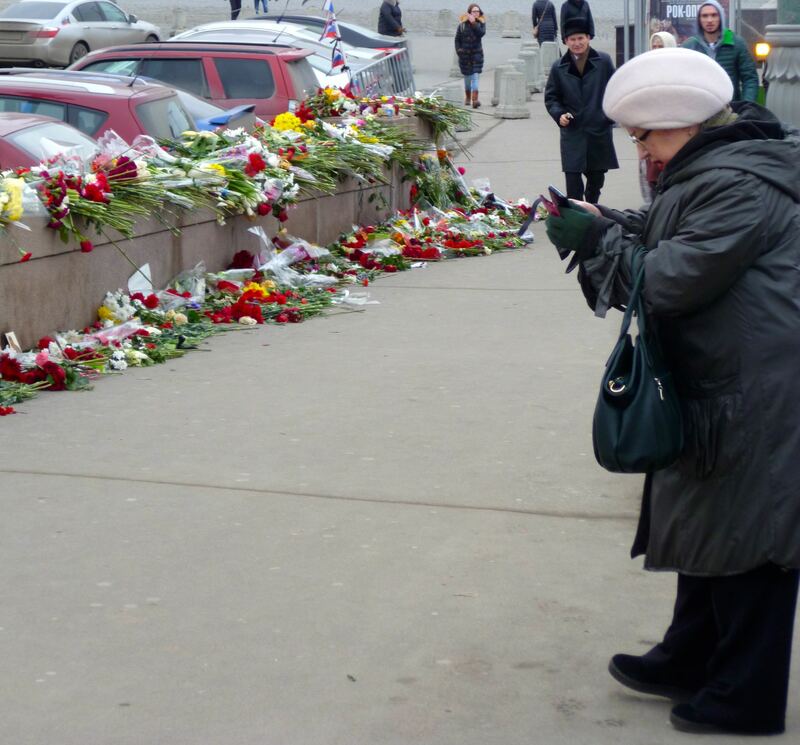 The infamous opposition march, scheduled for the Sunday after his death, was turned into a march of mourning and was attended by Putin’s backers as well as famous oppositioners. 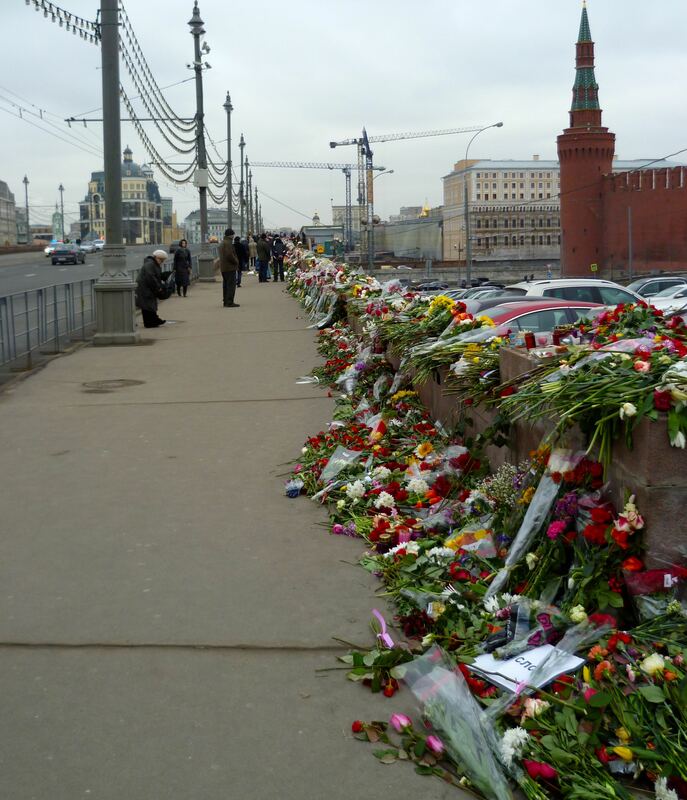 The Tuesday after the march I took a stroll down to the bridge where he was killed. By that time camera footage showed that the hit man had hid on the stairs underneath the bridge, jumping out to kill Nemstov right as he walked by. As his girlfriend stood screaming on the sidewalk, the hit man jumped into a white vehicle and sped away. Political killings didn’t end after the early 2000’s.. I’m not sure why you would think that.